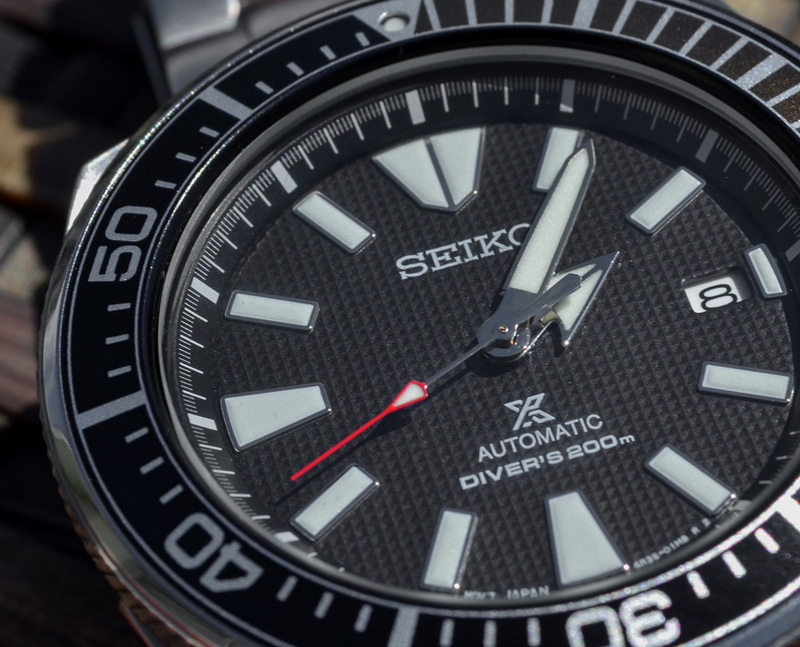 Seiko has recently released a line of Seiko Prospex Divers heavily inspired by 2004’s Seiko “Samurai.” The collection marks the non-limited-edition return of what’s arguably Seiko’s most sought after dive watch style. 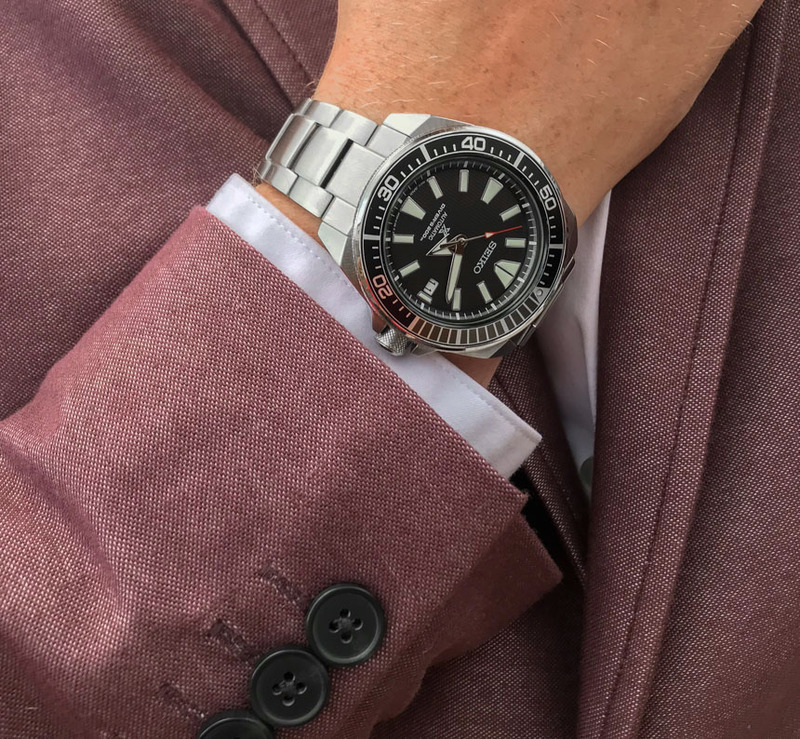 The chunky, yet handsome Seiko Prospex Samurai SRPB51 features a handful of dial options and brings back some features Seiko collectors have found most appealing about the brand’s divers – and it packs a lot of features in considering the relative affordability. 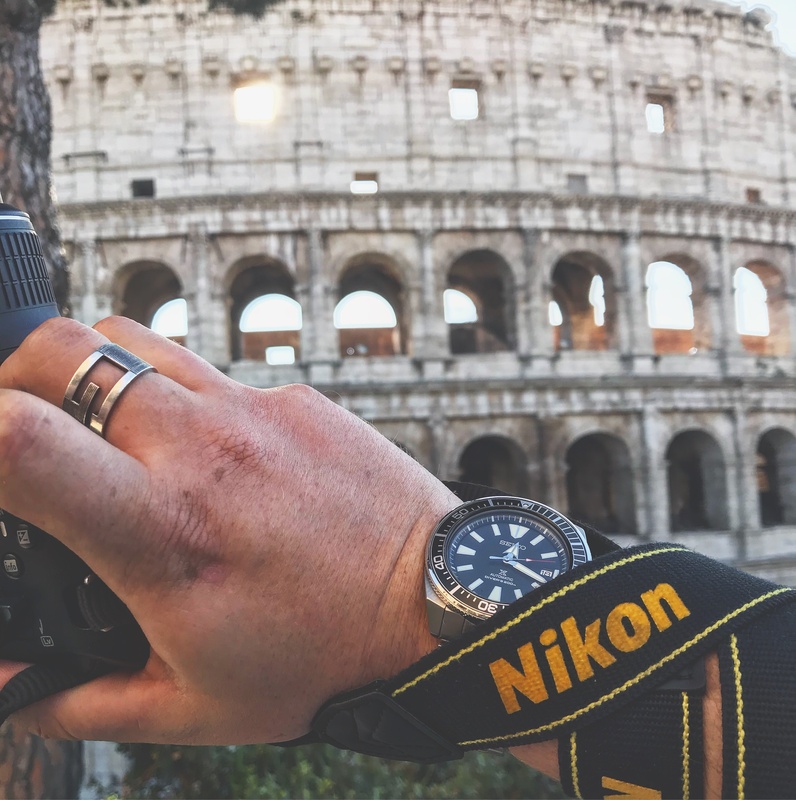 Seiko has always been one of the few brands that have a following that nicknames their watches and that’s something Seiko has adopted and eagerly catered to. 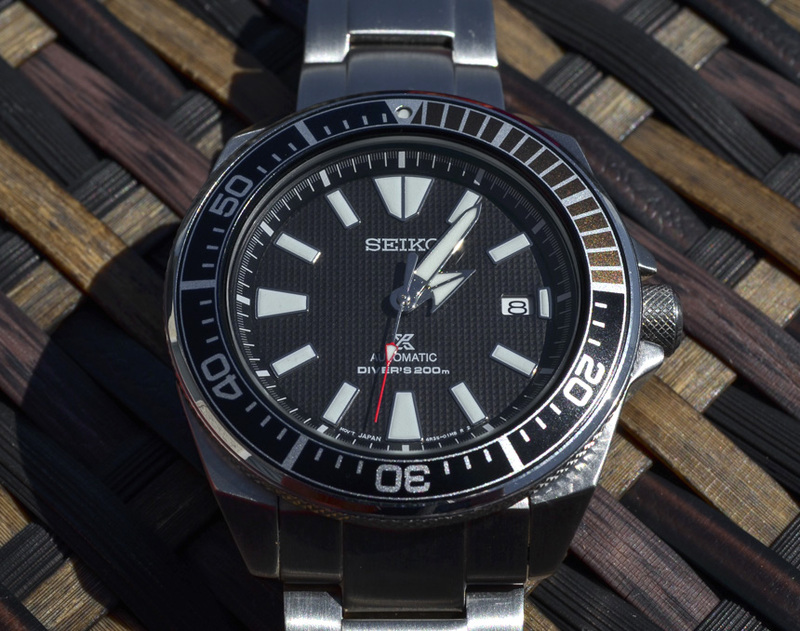 The Seiko “Samurai” first made its appearance in 2004 and was quickly and aptly named after its hands, giving the vague appearance of a samurai sword. It was discontinued a few years later, however, but collectors have kept it circulating and appreciating ever since. 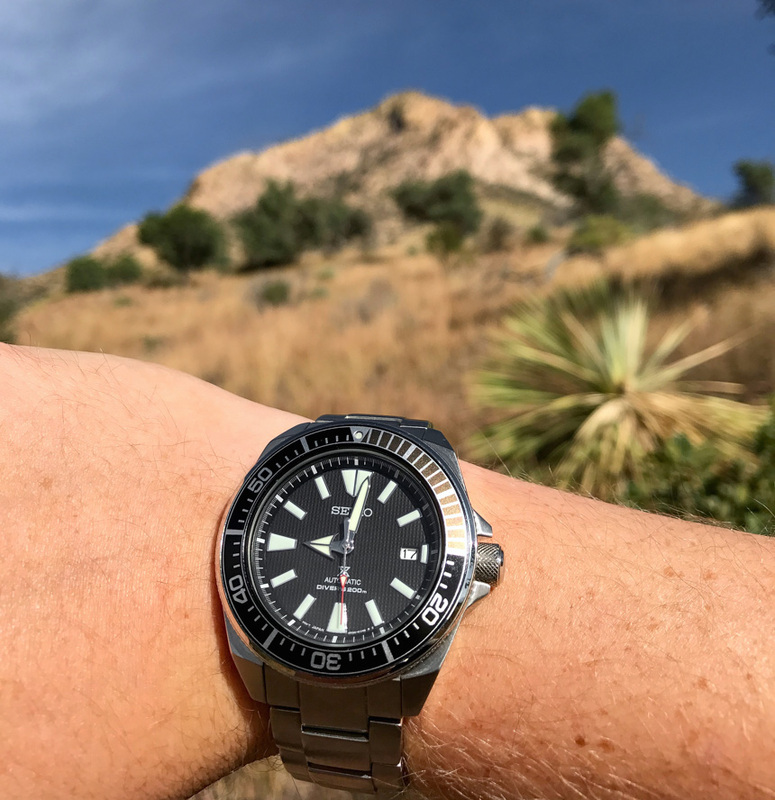 The Seiko Prospex SRPB09 or “The Blue Lagoon” (Wrist Time Review here) was released in February of this year and quickly sold out before I could get my hands on one – much to my disappointment. A few weeks ago, Seiko released the “Orange Samurai,” giving a nod to the original SBDA005 from days past. Unfortunately, Orange isn’t a color scheme that catches my eye, despite Seiko making a number of “famous” pumpkin colored watches, so I passed. When I heard that Seiko was releasing another line of Prospex Divers with the Samurai handset, I was ecstatic. 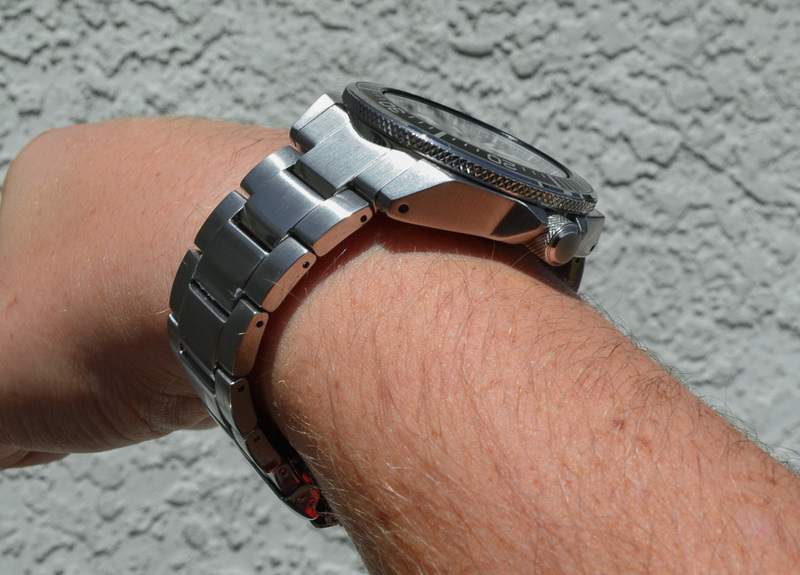 I settled on the SRPB51 – the black and grey model on a bracelet –and have barely taken it off my wrist since. 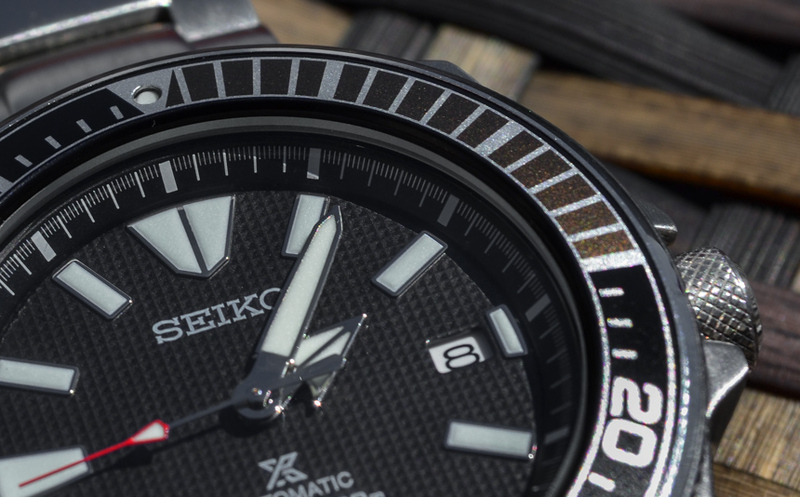 Seiko enthusiasts were first drawn to the Samurai for its unconventional, clean, bulky handset, and a titanium case and bracelet option (note: titanium isn’t available on these new iterations of the diver – they are only in steel). 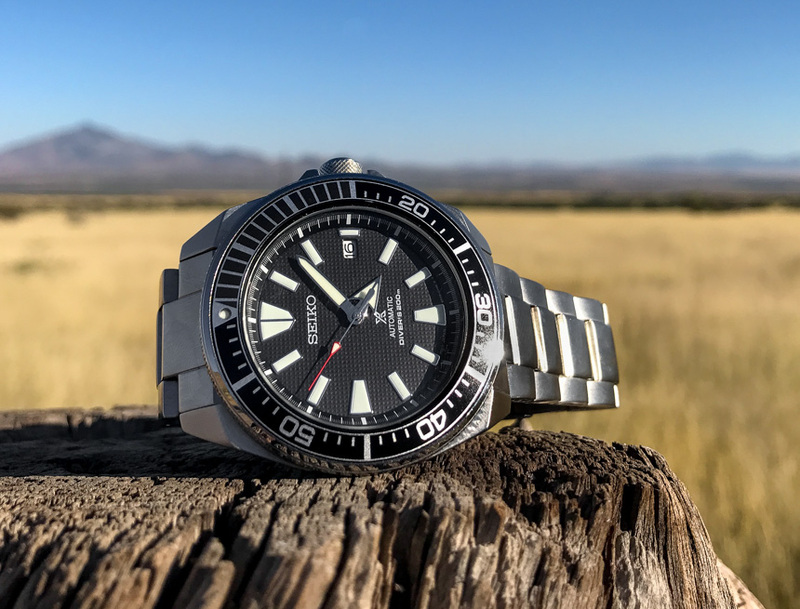 Unlike the many many dive watch options from Seiko, the Samurai has worn smaller and been a more refined timepiece – one that can be worn on serious dives or a night downtown. The angular and intentional lines of the Samurai put the model in a league of its own. The 2004 iteration had a boxier handset, but the more modern releases of the samurai have much cleaner lines and an updated hour hand shape. I feel that it brings an older concept to not only a potentially newer audience, but also caters to existing fans of the Seiko Samurai. The hobnail design around the edge makes twisting and gripping much easier – a welcome feature that adds a touch of perceived quality and a neat nod to the original. The case is fully brushed minus a small polished gap on the opposite side of the crown, giving this a defined tool look. And on that front, paired with 200m of water resistance, this watch is a sturdy tool. During a hike, I fell and absolutely slammed the edge of the bezel against a cave wall and was dreading coming out to see the damage. When I finally got into the sun, there wasn’t even a scratch. In fact, I couldn’t even tell where I dinged it. Aesthetically, this watch certainly isn’t boring. Like a proper dive watch, the unidirectional bezel insert features the first 15-minutes in grey instead of black, while the markers actually line up with the indices – something you would be surprised doesn’t happen as often as it should. The hobnail screw-down crown with realistically sized crown guards adds a nice touch that the original Samurai was lacking. The indices are superbly finished, and the crisp lines that pay homage to the original’s DNA put the little bow on the package. But the real stars of the show are the hands, which have been updated to fit the modern landscape. I mentioned earlier that the boxy and straight design has been replaced with a cleaner, polished handset. Gone is the seconds hand with (what I feel) is an awkward lumed box for a pointer, and included is a thin, classy spear-tipped hand with a smaller luminescent indicator. Something this handset boasts that isn’t even in the newer iterations of the Samurai is a polished handset. Personally, I love them. Besides water resistance, legibility is arguably the most important aspect of a dive watch, and the thick, bold hands and indices make this among the most legible watches in my collection. During the day, the Clou de Paris texture of the dial really makes the hands and indices pop. The clean polished hands against the matte square textures simply make it easier to tell the time at any angle. With previous models having brushed hands, the polish on the SRPB51 looks a lot more defined. I do like the blue one. However I’m getting blue-fatigue. I don’t have enough black watches so this worked. Is there a layer of hardlex on the bezel? so much better quality and value for money than any microsh*tstarter diver. It lacks a sapphire crystal and the hands are too short. There are better choices out there for the money that do not have these flaws. Very handsome dive watch for an honest price. My only gripe is the bezel material: I think that aluminum insert is impractical either in Oris Diver’s 65 (otherwise great watch!) or in Seiko Samurai. Totally agree. A hardlex insert would have been preferable to exposed aluminum and shouldn’t have any effect on price. Have never seen them using Hardlex for bezel inserts – I think the reason is that the Hardlex isn’t much harder. Sapphire or ceramic insert is, of course, harder – but more expensive. 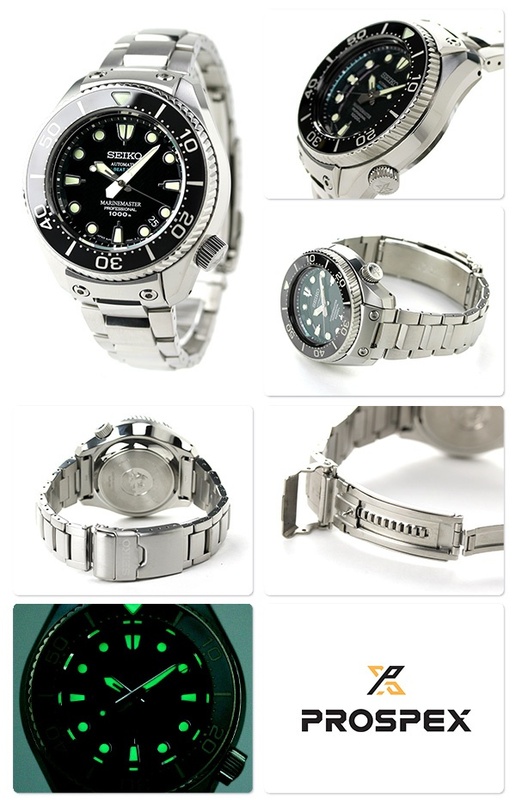 And as far as I know, Seiko doesn’t use any ceramic inserts way up to MarineMaster (around $1,500+). Ceramic would be preferred over other options, but I know that the scale on that material has not yet been achieved to bring it to watches in this range. But despite them having not done it before, I bet Seiko could certainly achieve a hardlex insert, which while not as scratch resistant as sapphire is certainly more so than exposed aluminum. I’m also sure the Seiko faithful would gobble it up heartedly. Indeed, a hardlex bezel may be more attractive than aluminum. P.S. I was wrong regarding the MM – it has a SS+laquer bezel, not very scratch resistant either. I thought there was an updated iteration with Ceramic? https://uploads.disquscdn.com/images/855cee09e5acb56982345f4f69530bac6bab13f159eb0d9d52483b90f615ad52.jpg Do you mean the SBEX003? Maybe. I’m not a Seiko expert, I thought I remember an MM update with Ceramic. 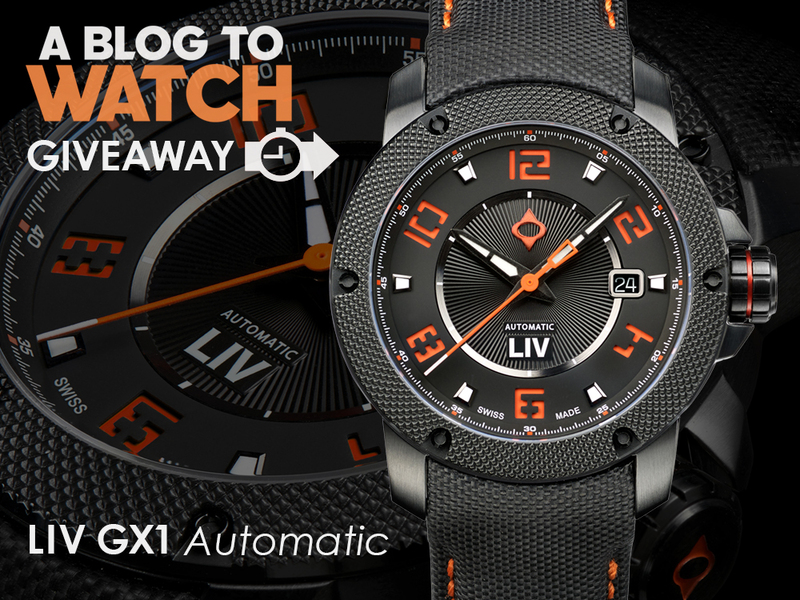 The SBEX003 is a great watch, but 10x the cost of the one featured in this post. I wonder why not heat treat and then hard anodize the aluminium. It won’t be scratch proof but certainly more scratch resistant. 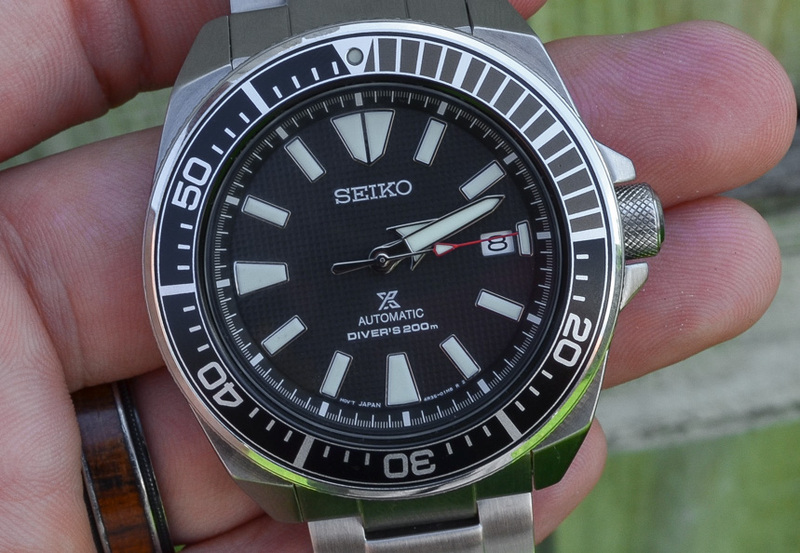 Handsome enough and certainly fine value, although it does seem to lack any real distinction from a few other popular Seiko divers in this tier. Maybe it’s just me but the red on the seconds hand is out of place and looks mismatched. White would have been a better option for that bit methinks. Hobnail texture on the bezel and clous de Paris on the dial? Quite the worldly watch! This is nice, Can’t go wrong with a Seiko unless they stick Grand on the front. Would happily wear it but one scratch and it’s gone. What’s wrong with the Grand Seiko’s? Do you know of a brand that doesn’t? And without any elaboration. Classic Ray. He can’t explain his own ramblings, I don’t suggest you try. Lovely watch. Great back story. Very nice write up. Although, as others have mentioned, in this time piece, I am partial to the blue one. For some reason, while admiring Samurai from afar, I never wanted one for myself. Just not my astetics. I Like it, but don’t love it.. I would buy a Sumo first. Why does this watch have to suffer a crappy crystal when even right now on ABTW is an independent watch on Indiegogo that has a thick sapphire crystal and a superior in accuracy ETA movement for $590? The Seiko corporate suits sure do look on their customers with contempt. I’m not sure you’re right: hardlex IS more shatter resistant than sapphire, this being tool watches, isn’t Seiko implying their customers are more likely to take their watches on the field, on real dives, on caves, and thus the need for a less brittle crystal? It’s actually the opposite of contempt. Desktop divers are a dime a dozen. I’ve never seen even a photo of a sapphire crystal shattering — except when some jackass uses a sledge on his watch to “test” it. They are doing it to save a buck. Typical Japanese corporate penny pinching. I guess you haven’t noticed, but their best watches (which are inexplicably priced even above comparable Swiss brands in some cases) all have sapphire crystals. They sure have got you fooled. I was just playing devil’s advocate, and the logic (on both sides) is sound. They haven’t fooled me, as I’ve never bought a new Seiko! 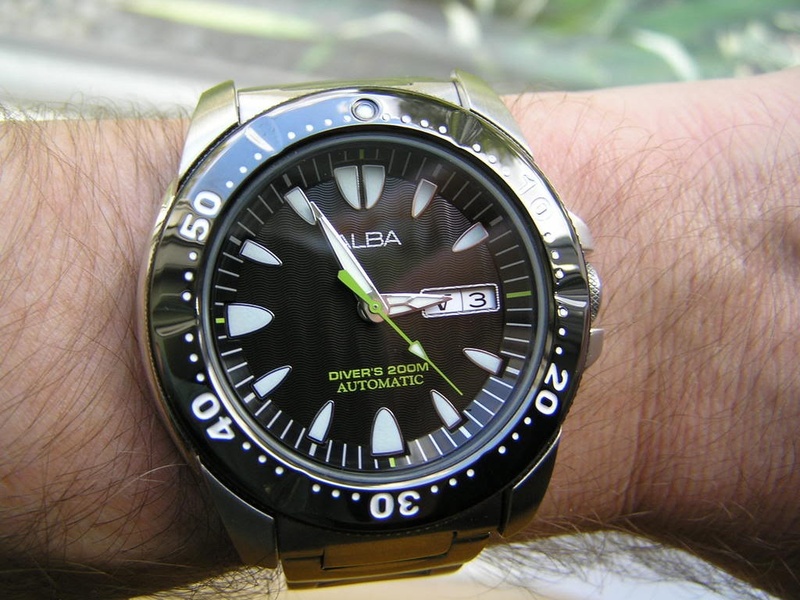 ALBA is a cheaper subbrand by Seiko. 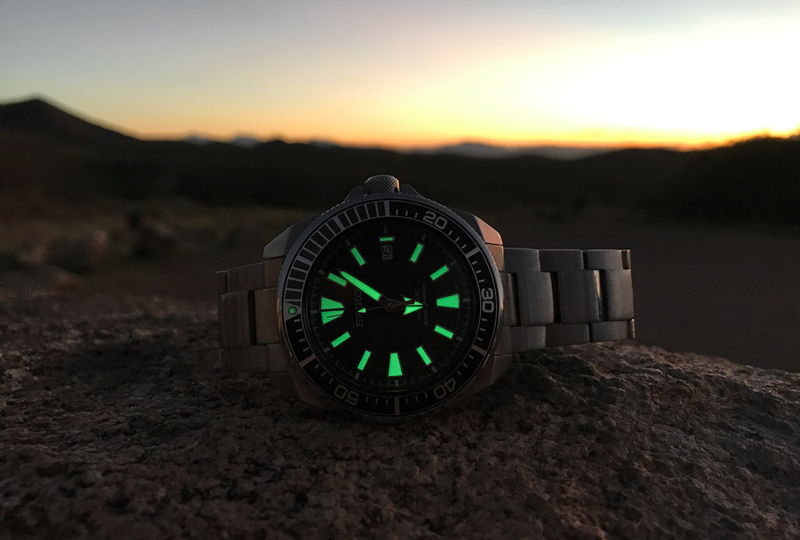 Another solid Seiko diver. Tough to find fault with their pieces. My Baby Tuna has had more bumps and bangs than any of my other pieces, and yet the Hardlex crystal remains totally undamaged. I do agree though that it smudges and collects dust particles rather easily. I’m constantly cleaning it. I’ll probably end up popping for the recently released orange dial version of this watch. Unlike the author, I’m a big fan of orange dials. “Aesthetically, this watch certainly isn’t boring” what are you talking about? You hardly can get more boring than this! 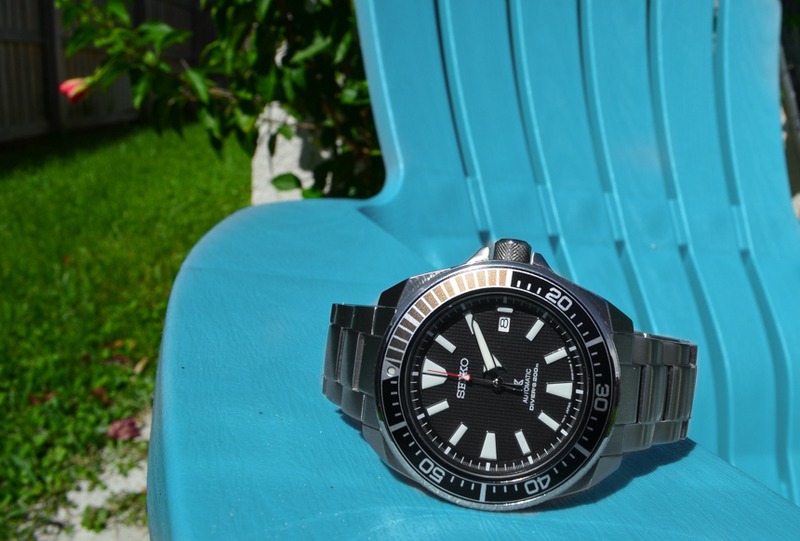 Seiko divers (sorry, diver’s) are great, solid, good looking, great buy, and I’d very much like to have one, why call them what they’re -very clearly to anyone- not? Boring sometimes is fine. Nothing wrong with a sober, discrete and boring tool watch. Maybe the orange ones aren’t boring, but a black/grey one? Come on. Don’t be scared of words. To each their own I suppose. I’ve seen (and own) my share of “boring” dive watches, and this one is definitely more pleasing to the eye than a lot of offerings in this category. 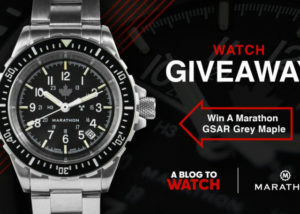 Especially for a black/grey model… especially for a Seiko. Perhaps it takes more of a nuanced look, or an in-person study, but I found after spending a significant amount of time with the SRPB51, the last word I would use to describe it would be “boring”. I started doing a little research to see what else is out there and came across the new and greatly improved 2017 Hamilton Khaki Navy Scuba — which has a sapphire crystal, an 80 hour power reserve, far more accurate Swiss movement, new bright blue super lume, and priced at about the same or less on the net with a little looking around. One right now on bracelet can be had for $475. Seiko continues to be the most overrated “bargain” watch. Dull. Dull. Dull. Dull. Dull. it caught my eye. what size wrist you have? Thanks man! I try to write like I like to read. A strong backbone that’s conversational. Mine is a bit smaller so I setllled for a smaller watch.